The Galaxy Nexus is Google's successor to the Nexus One and the Nexus S. The entire world is eagerly waiting to see the devices on their hand. After October 19 announcement, galaxy Nexus will be available on the stores from November in different European and American countries. People of Australia are also waiting for the ICS running Galaxy Nexus. And Mobicity is offering the handset on pre-order. And they have the unlocked version of the handset for you. The devices ships in November and comes with an exclusive 24 month warranty. 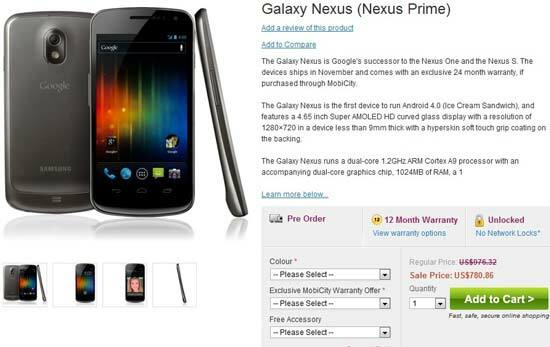 Price of this contract free Samsung Galaxy Nexus is $780 in Australia via Mobicity. The Galaxy Nexus is the first device to run Android 4.0 Ice Cream Sandwich, and features a 4.65 inch Super AMOLED HD curved glass display with a resolution of 1280×720 in a device less than 9mm thick with a hyperskin soft touch grip coating on the backing. The Galaxy Nexus runs a dual-core 1.2GHz ARM Cortex A9 processor with an accompanying dual-core graphics chip, 1024MB of RAM, a 1750 mAh battery, a 1.3 MP front camera and 5 MP rear camera capable of 1080p video and zero shutter lag, Wi-Fi a/b/g/n, Bluetooth, GPS, and NFC.